This gem of a restaurant is tucked away in a side street of Stellenbosch and is a great find. I can highly recommend you take a trip through there to give them a try – you will not be disappointed. From the linen, to the cutlery, the service and the food, there is not one thing I could fault about our fine dining experience. The wine list is excellent and offers a good selection of wine by the glass. I am going to start pricing the Meerlust Rubicon (my favourite wine) as a guide post in the same manner I always order the crème brûlée. The Rubicon 2006 goes for R440 a bottle. We chose a Neethlingshof Cabernet Sauvignon Merlot Blend 2008 (R125) and as expected from this estate, the wine was great. As we were joined by friends, I could not write notes about the menu. I did however keep the bill and so I can tell you what we ate. The menu is varied and traditionally South African. 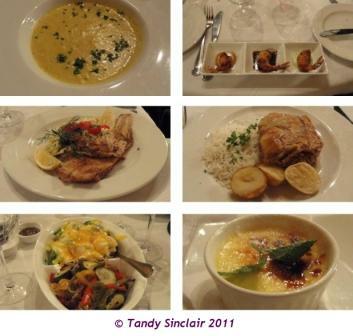 What sticks out most for me was the possibility of having a taster plate of main courses or desserts of local treats. I think this is great if you have overseas guests as they can be exposed to our unique flavours. Starters at the table: vegetarian tart (R50); soup of the day (35) which was butternut and I thought really good; prawn trio (R50); and a biltong gnocchi (R50). Lara and Michael shared the gnocchi and I heard her say “7” which I thought was her rating for the dish, but was in fact the number of gnocchi in the starter. We all enjoyed our starters and they were the perfect portion size. Main courses: line fish of the day (R120) which was sole – and Bev got two large ones that she could not quite finish; Marais’ chicken pie (which I had to have due to the ‘national’ Western Cape jokes of Gatiep and Marais) packed full of chicken (R65); rack of lamb (R130); and braised oxtail potjie (R125) which I tasted as Lara had some left over and it was soft and falling off the bone. The main courses are more than generous and you will not leave there feeling hungry. For dessert I had the crème brûlée (R40) which was above par! Michael had the Cape country pudding (R50) a taster of melktert, cooksister, malva pudding and Amarula mousse; and Lara had the trifle (R50). Sole is on the SASSI Orange list. Hi Tandy…I am a new blogger, and am so glad I have found yours. Love this review and am so sad I missed it as I spent a few days in Stellies last week. I have just posted a summary review on my blog of my favorite spots there. Lovely post. Thanks Lisa-Jane and welcome to foodie land! I am off to subscribe to your blog 🙂 Please see the competition I am running, maybe you have time to enter? I visited South Africa more than 10 years ago and one of the highlights were the fabulous restaurants and lovely wine. I must put this one on the list if I ever make a return visit. So nice to have a faultless dining experience. De Volkskombuis sounds like an absolute treasure of a restaurant.! I would have a tough time deciding what to order. At the moment, not eating sole for the past 2 and a half years would be top of my list I think.